Roads are clogged, flying is a hassle, taxis are expensive, and public transit is rarely there when you need it. What if there was a better way to travel? According to Elon Musk, the future of transit is the Hyperloop. His idea involves a rigid tube held at a near vacuum. Passenger pods could then travel inside at almost the speed of sound. They also levitate inside, of course, reducing friction to a minimum. If Musk's math is correct, the system could take you from L.A. to San Francisco in just 36 minutes and cost 90% less than traditional public transit. The idea has many entrepreneurs excited and it's now a race to see who is the first to build a working Hyperloop and bring it to market. There are currently two main players: Hyperloop One and Hyperloop Transportation Technologies. HTT was set to start construction back in 2016, but missing permits delayed their construction. In the meantime, Hyperloop One has been hard at work and they finally have a test track built. Speaking in Dubai, Hyperloop One CEO Rob Lloyd unveiled the first images and construction plans for their new test site. The "DevLoop" facility is located about 30 minutes from Las Vegas and is set to begin public trials in the next few months. 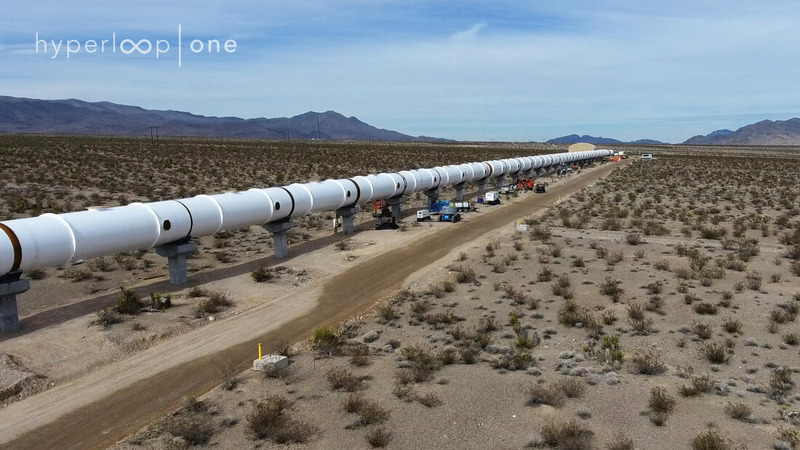 The 500 meter long tube isn't that impressive from a visual perspective, but it's a big milestone for the Hyperloop community. Future installations will be much longer though since their current test track is only long enough for a few seconds travel at the speeds they're planning.